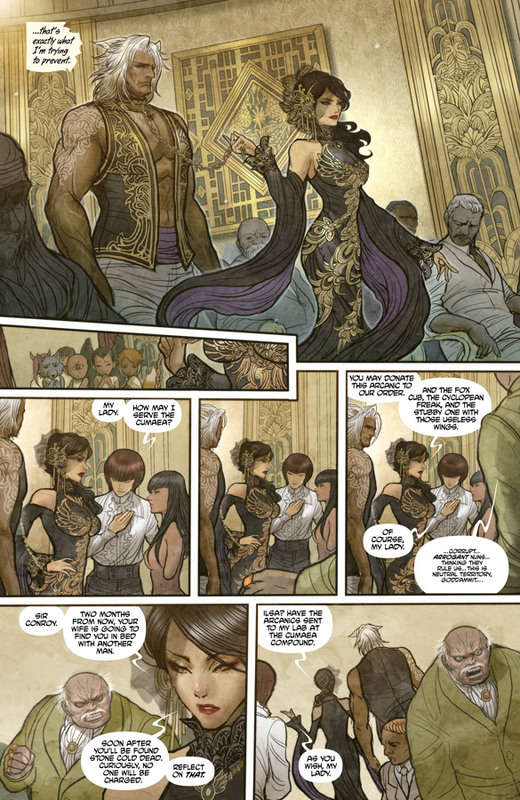 Though you’d expect a book called Monstress to house a few gnarly creatures, writer Marjorie Liu’s new Image series brims with monstrosity of every stripe. Yes, there are colossal behemoths sure to devastate some perfectly good infrastructure, but the metaphorical terrain is far richer. We’ve seen the true beasts and—you guessed it!—they are us. Maika, the book’s hero who shares a psychic link with a kaiju-like monster, has survived a massive war, the details of which remain to be seen, but the degree of hatred present in the first issue hints at high casualties and horrendous acrimony. In spite of its magic and occasional vulpine citizen, this is a familiar world rife with misfortune, where people subjugate and torture those they deem beneath them. Monsters have long reflected humanity’s internal flaws, from Frankenstein born of Mary Shelley’s miscarriages to Flannery O’Connor’s frequent use of deformity. But there are plenty of clever spins on monstrousness as well, like the notion of King Kong as a love story or that eye-of-the-beholder irony that casts Marilyn as the ugly duckling of The Munsters. The monster theme is exceptionally fertile ground for analogy—the pariah, the stigmatized, the misunderstood, not to mention the brutal. Within the pages of the extra large first issue, Liu sows all those seeds. Monstress, much like Sana Takeda’s prodigiously detailed art within, is poised to take on ideas both personal and universal. Liu took some time to discuss monsters, mythology and why she felt compelled to tackle so many dire themes. Paste: So Monstress is about a girl with a psychic link to a monster. Can you elaborate on that a bit? 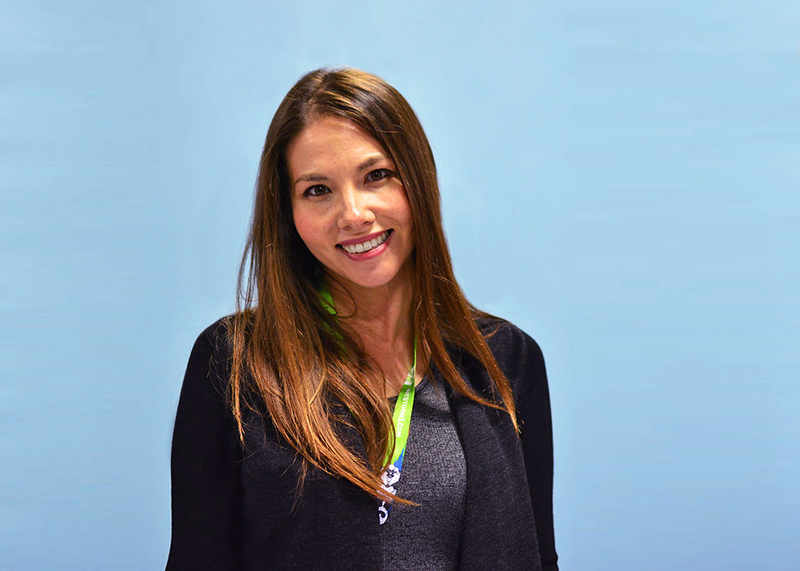 Marjorie Liu: Basically this is a story about a girl who has survived a cataclysmic war. And it’s really asking how does one survive war? How does one survive the trauma of war? That is the journey of this young woman, Maika. She feels incredibly alone in the world. She has a friend, but she’s almost scared of having that friend because she’s scared of losing people. On top of that, she thinks she’s going insane, but really it’s because she has a psychic link to this monster. She feels it changing her. She feels like she’s losing her humanity. So the book is really her journey as she starts to put herself back together and relearn what it is to be human. Paste: The book is set in an alternate 1920s China. Can you tell us a little about the real history of that era? Liu: What’s interesting is that people always talk about Paris. In the 1920s Paris was the center of the world. Well, Shanghai was the other center of business, arts and trade. I wanted to set it there because I’ve spent a lot of time in China, it’s part of my heritage and who I am, but I haven’t seen a lot of fantasy epics, or Asian steampunk, and I thought now’s the time. Paste: So, other than the monsters, how does your fantasy version hew to or stray from history? Liu: It’s not just set in China—it’s also set in Mongolia, Japan, Hawaii. But it’s different in the sense that there are non-human people, called the Arcanics. I drew from mythology for the different races. There are talking cats that are spies and assassins. They’re based off of the Japanese Yokai. The Yokai are supernatural creatures from Japanese mythology. For example, the cat Yokai can raise the dead and speak to ghosts. So some of these cats are able to raise the dead, along with all their other mysteries. Paste: You’re a prolific novelist. 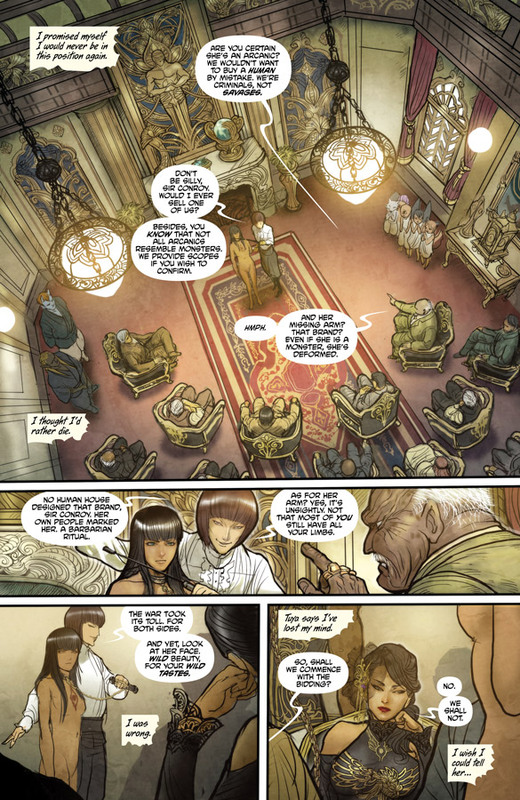 Why did comics seem like the best medium for Monstress? Liu: Well, there are some stories that just work better in a visual medium. The thing is, Sana [Takeda], who is doing the art, is a complete visionary, and to see her create this world has been extraordinary. I guess I could have written it as a novel, but I wanted to see it. Paste: The first issue is much longer than a typical comic, and yet, it only scratches the surface. Is that a little bit of your inner novelist creeping into the comic writing? Liu: Probably. It is hard for me to write short, especially with this story. With Marvel it was easy to stick to 22 pages. Monstress has been hard because I want to keep writing longer, but I can’t. Poor Sana can only draw so much in a short amount of time. Paste: Speaking of Sana, the decor and architecture is unbelievably detailed in the book. Is she shaking her fist at you now, wishing you chose a more minimalist setting? Liu: She hasn’t said that! But what’s extraordinary about her work is that her backgrounds have just as much character as the characters themselves. So when you start reading the book, you’ll see that the world is fully fleshed out: the engravings, the uniforms and costumes. Her eye is impeccable. Paste: I hear you’ve plotted out a pretty good chunk ahead. What can we expect? Liu: This is a very, very dark book. I’m sure you’ve gathered that, but this book is not going to get any lighter. So we’ll see Maika’s relationship with the monster develop, we’ll see way more of the world, it’s political structure. This world is constantly getting bigger as I write. We’ll see more of the war and Maika’s past life. 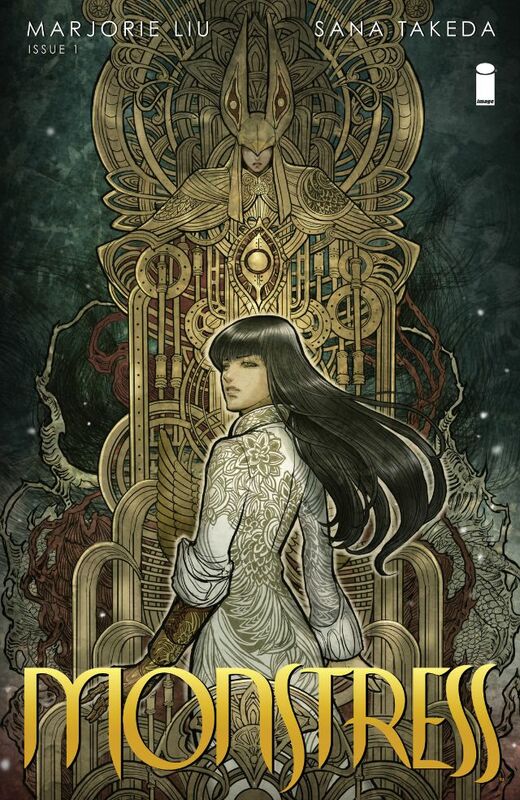 Paste: Tell us something about Monstress that you haven’t told anyone yet. Liu: Mr. Ren, the cat, started out as a lark, because I like cats. This cat has become a super-duper essential character to the book in ways I never expected. The same thing for Kippa, the little fox-girl. I put her in because I thought she was cute and she took over the story. I did not expect when I was writing how much this little girl would matter. Literally, she was just going to be a background character, and all of a sudden she became essential. Paste: Let’s talk monsters. There was a line in the book that says “They don’t see us.” Can you explain a little about your monsters and how they exist and interact in the world? Liu: More will be revealed about them as the story continues, but what I will say is that these monsters are, most of them, trapped in another dimension. Let’s just say they can be seen but not touched. But they have had an influence on the world around them. The Arcanics worship them as gods, and why wouldn’t they? If in our world you saw immense creatures just appear out of nowhere and disappear, that would have an incredible influence on culture, art, religion. Paste: So we’ll abandon the Pacific Rim references? Liu: But it’s a fair reference! All I can say is, this is going to be a long story, and a lot is going to happen along the way. This world will continue to evolve and things will be revealed. A lot of questions will be answered about the Kaiju. I guess I shouldn’t use the word “Kaiju.” We’ve been calling them that but in the book they’re called Monstrum. Paste: But do they behave as Kaiju, wreaking havoc and all? Liu: Havoc will definitely be wreaked. Paste: How are you going to play with the theme of what it means to be a monster? Liu: These two are stuck together. They’re basically trapped with each other. It’s going to be a very difficult relationship initially, because they don’t know what the hell is going on with the other, they don’t know why they’re in this situation. So exploring that, and exploring this relationship between the two of them, is going to be one of the key cornerstones of this story. Maika is going to discover her humanity through this monster, and the monster is going to discover itself as well. When the series ends—I know how the series finally comes together, however many issues from now—they will be very different from where they started. Paste: Monster as “The Other” has many potential layers in this story — being an outcast, a refugee, cruelty, war, cannibalism—you seem to have covered all of them. Liu: I’m not just dealing with literal monsters, I’m dealing with monstrousness in all its forms. And how it deforms people—how it deforms their psyches, how it deforms their bodies and how it deforms worlds. That was a really big thing for me to tackle. Paste: And you have the literal deformity with Maika being an amputee. Being no stranger to damaged characters, how are you broaching the personal aspect of that trauma here? Liu: I’m addressing it issue by issue. When the story starts, Maika is an unhappy young woman, and really broken. She does not know herself and she feels really alone. This monster is going to become part of a larger community, because part of what she has to learn is how to regain her humanity through friendship, through love, making herself vulnerable again to these feelings she’s locked herself away from. So if she was perfect and happy at the start, what’s there to write about? This is a girl who’s been through hell and back, and she didn’t survive unscathed. I wanted to show the mental and physical scars of war. We see a lot of veterans who put their lives on the line and they come home injured, with either physical or psychic wounds, and they have to learn how to move forward and live whole lives. For Maika her psychic wounds are way more difficult for her than her physical ones. That’s what really lingers. Paste: I couldn’t help but think of Mad Max’s Furiosa when I saw Maika in action. Liu: Maika always had one arm, before Mad Max came out. But what I really loved about Furiosa, and what I was trying to capture with Maika too, is this idea of how the power that comes from within, and confidence and resolve, is more important than anything. Maika has lost a limb and she still feels the ghost of that limb, and what she went through when she lost her arm was deeply traumatic. She is still a whole person, she may be missing her arm but who cares, she is still her. Paste: So far, in terms of hatred, these warring races make the Montagues and Capulets look like frienemies. Why are they so mad? Liu: We have the Cumaea, I call them the witch nuns. They are an order of women that believe in science and the purity of humanity. They believe that the Arcanics, who are these sort of mixed race “others,” and are sub-human, demonic, that they are an affront to the Earth. It’s nothing new, it’s Racism 101—Nazis, slavery—the idea of one people dehumanizing another for power. The Cumaea have found a way to monetize Arcanic flesh. When you can monetize someone else’s body, of course you’re going to dehumanize them, and spin a culture of hate against this other people, because it makes it so much easier to use and abuse them. Paste: Those are some very heavy themes. Liu: I had this really dark story I wanted to tell about a girl who survived a war. I was thinking about what I want to put on the page that’s been bothering me. I’m really bothered by questions of humanity, questions of war, questions of slavery. All of that just coalesced. Paste: Are there any particular reason those questions bother you? Liu: Growing up as Chinese-American, as someone who experienced racism, questions of “otherness” are always at the forefront of my mind. Also, growing up in a family where my dad’s parents were in China during World War II—my grandfather was part of the air force, and my grandmother when she was 14 had to leave her home and walk across China with a bunch of other students to escape Japanese troops. Just listening to their stories about surviving, fighting, battling for their lives…that’s just one fraction of why these questions are really important to me.